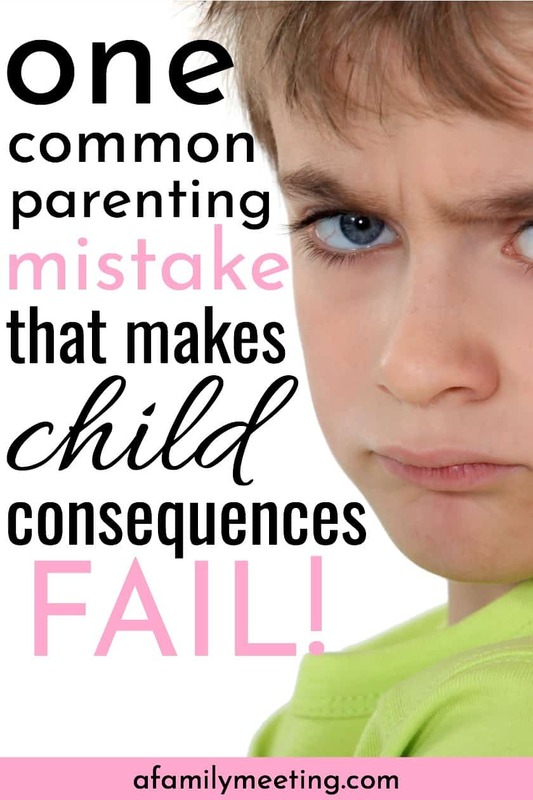 The Most Common Discipline Mistake Parents Make and How to Fix It! There’s a reason that the consequences you’re using with your child aren’t working. When it comes to consequences, typical grounding, taking things away, and punishment doesn’t work long term, unless your child gets it deep down in his heart. 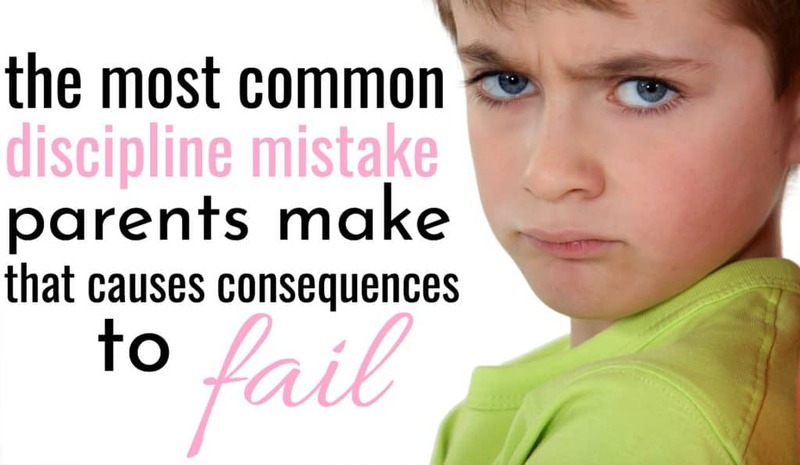 When delivering a consequence to your child, be sure to avoid the common discipline mistake parents make that causes consequences to be completely ineffective! Do You Take Things Away? 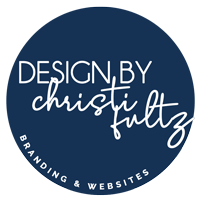 I want to take just a minute and remind you of this common discipline mistake parents make, so it can be on your radar to avoid. Fixing it doesn’t take that much extra time and effort and it’s so worth it. You have your go-to list of consequences. Taking away toys, taking away screen time, withholding treats, etc… and when your child behaves poorly, you take those things away for a set amount of time. And therein lies the mistake. Behavior has very little to do with time and everything to do with habits and mindset. When you or I take screen time away from our child for a set amount of time, the consequence is the amount of time the child is away from the screen time. That 1, 2, or 7 days is the consequence in and of itself. What Should the Consequence Actually Be? When the consequence should be: nothing good in life will come to you if you don’t earn it. Therefore, you may not have toys, screen time, treats, etc until you have earned it back with good behavior. How long should your child show good behavior before earning back the privilege? That depends on the behavior. Small misbehavior may only take a few days to correct, moderate misbehavior, maybe a week or two… while significant behavioral problems typically require months of training. Consider the difference between getting a speeding ticket, and being put on probation. Speeding tickets cost a little money and are inconvenient. But let’s be real… has a speeding ticket ever stopped anyone from speeding? I think not. Our children will have to work their tails off, be kind to people, show respect, and follow rules and laws for the rest of their lives, in order to lead a blessed life. It’ll be much harder for them to learn how to do those things effectively later if we aren’t training them now. In much the same way that I get to enjoy the privileges of society by being a good member of society, so my child gets to enjoy the benefits and privileges of being in our family by being an upstanding member of our family. Therefore, when it comes to consequences, time frames are all relative. Relative to the child, relative to the situation and to the behavior. How long it takes for my child to earn back a privilege is a direct result of his or her posture of heart. His thought processes, words, and actions will determine the level of privilege he is allowed. Not a specific amount of time. Resist the urge to make consequences based on a measure of time. Instead, watch and listen to your child. What exactly is the behavior problem? Once you’ve identified it, work with your child to train better behavior. Use special privileges, such as toys, screen time, treats, etc, as rewards for a job well done. Joy comes from the heart. While a child can have fun playing with something or watching TV, those things are only tools for joy, not the joy itself. You aren’t robbing your child of joy by taking away the “tools.” Alternatively, she’ll be learning that all good “stuff” in life is earned and that joy resides within her heart. Take some time to read over my 5 Steps To Raising A Well Behaved Child ebook (get it here) then head over here to read this post. Use the two, together, to come up with a game plan for training for your child. Establish your family’s government and make a manual of sorts for correction, consequences, and discipline. « Need a List Of Consequences for Bad Behavior that is Age Appropriate?